UNITED NATIONS, May 27 -- In the UN budget committee, the day before its session on peacekeeping is to end, a proposal for a $10 million office in Addis Ababa was turned in. The African Group immediately "regret[ted] the timing of the submission of the report... the afternoon of the day before the scheduled last day of the second resumed 64th session of the General Assembly." The Ban Ki-moon administration has seven months to prepare and submit the proposal, but waited until the 11th hour. The Russian delegate said perhaps we will not even be able to discuss this proposal, there are other issues we must address before the end. These include a proposal to restructure the Department of Field Support. Russia is opposing that, Inner City Press has learned, because of the proposal to decentralize procurement of services including air services. Russia has cornered that market while the contracts have been doled out in New York; it would be less certain if decentralized. Some delegates say Russia's position on the Addis Ababa office might not be unrelated to its fight to retain control of UN air contracts. But the Ban Ki-moon Administration's inept late submission was making this gambit easy -- intentionally? Making the proposal for the Ban Administration was Taye-Brook Zerihoun, who recently replaced, if only temporarily, Haile Menkios on this day represented the UN at the inauguration of Sudan's Omar al Bashir, indicted for war crimes by the International Criminal Court. Zerihoun, rather than addressing the delay to the penultimate day of the Ban Administration's proposal, apologized for his boss Lynn Pascoe not being there. He had planned to be present, Zerihoun said, but had to rush a few hours ago to go with Ban on his trip to Africa. The argument then was that although the UN's actual plan for Africa was slapped together at the last moment, Ban's flight to Africa shows his commitment. He will play soccer with Yoweri Museveni and Nicholas Cage in Uganda -- where students are preparing to protect his and the UN's and ICC's inaction on human rights abuses -- and later to attended the opening of the World Cup in South Africa. So is this proposed merged office in Addis Ababa nothing but a political football? The Department of Field Support restructuring proposal is also, for now, being opposed by large troop contributing countries Pakistan and India. DFS chief Malcorra is said to be arguing that it is not worth trying to do the reforms piecemeal. So perhaps nothing will be passed. 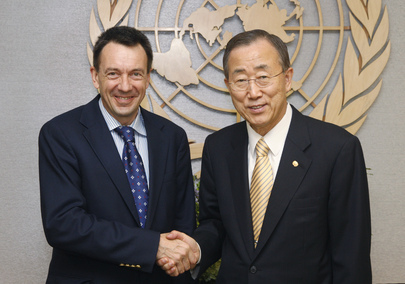 Chairing the meeting was Peter Maurer of Switzerland, who has been moonlighting this month as a Swiss minister. He ended the meeting by saying he will"consult with the Bureau" given the views expressed. As he left the Conference Room, Maurer chatted with Zerihoun. Why turn in an ostensibly important proposal so late? Watch this site.